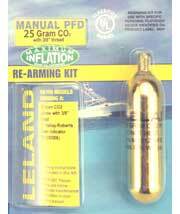 Metallic trainer version 17 - 21 gram CO² cylinder for MD1122 Underwater Demolition Team (UDT) Life Preserver. *** UDT vests manufactured prior to early 2012 use this CO² inflator which has a 3/4"-24UNF-1A thread. The Mustang Survival MD1122 underwater demolition team (UDT) life preserver provides a minimum of 19 lbs buoyancy when inflated. The MD1122 is intended for use as emergency equipment by underwater demolition teams and is approved for use by Naval Sea Systems Command. The MD1122 is currently being used in Basic Underwater Demolition / SEAL training. 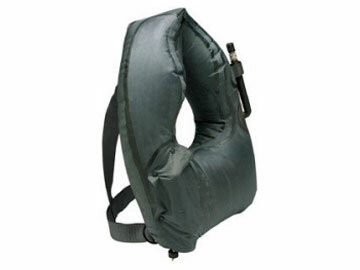 SEAL's use this life preserver for surface swimming, Hydro-Reconnaissance and Over-The-Beach missions. **UDT MD1122 vests manufactured in 2012 or newer use the CO² inflator 840AMU-84121Z which has a 3/8"-24UNF-1A thread. Call 763-263-9835 to order. 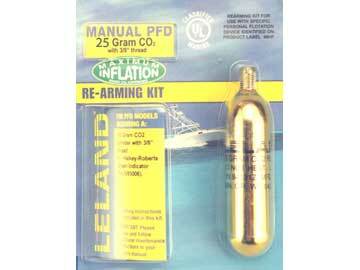 ***NOTE: This is the metallic training version not for use near underwater mines.